Information that has recently surfaced suggests that companies including Tyson, Pilgrim Pride, Perdue and several others, have allegedly conspired for almost a decade by sharing detailed information and statistics related to Grower compensation in a concerted effort to depress Grower compensation paid by members of the alleged Integrator cartel. This information was allegedly shared among Integrators through Agri Stats, a statistical research and analysis firm. It has additionally been suggested that there was an express or implied understanding among the nation’s largest Integrators not to contract with or “poach” growers that have worked with competitors, thus further depressing compensation ultimately commanded by Growers. 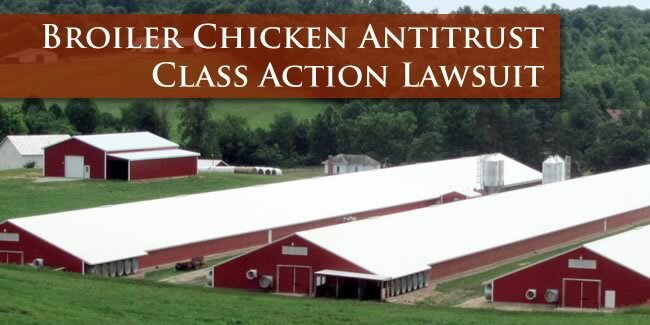 If you have been a broiler chicken Grower and have supplied chickens to prominent poultry companies over the past several years, you are urged to immediately contact Audet & Partners, LLP for a free, confidential case consultation with one of our antitrust class action lawyers. We will be able to assess the strength of your claim for monetary damages as part of the boiler chicken lawsuit. You can request a free consultation either by completing and submitting the inquiry form on the right side of this page, or by giving us a call at (800) 965-1461.